Giving Mexico’s rarest porpoise, the vaquita, a fighting chance in the face of poverty, corruption, and greed. In April, Mexico’s Upper Gulf of California is a place of light. Nothing blocks the sun on its arc across the sky. It glares from the green water, and beams off the pale desert and buckled mountain ranges to the west. It foils wide hat brims, burns through shirts, sears the insides of nostrils. It bleaches the very air. And on this still day, its bright fingers wring the color from several carcasses tangled in a drifting net. The MV Farley Mowat, a 34-meter ship that belongs to the environmental group Sea Shepherd Conservation Society, turned up the mess while on a special patrol for the Mexican government. Crew members watch their grim find twist in the water for three hours before a Mexican Navy boat arrives to take over. A half dozen military and environment officials mill on its foredeck and roof. Another man, his face wrapped in a camouflage bandana and his arm cradling a machine gun, stands watch in the stern—like a period at the end of a sentence of warning. At last, two of the officials tangle their fists in the mesh. What they heave from the sea is so dead it’s almost spectral: boluses of white flesh dangle from backbones thick as arms, and gaping jaws tear away as if attached with wet toilet paper. 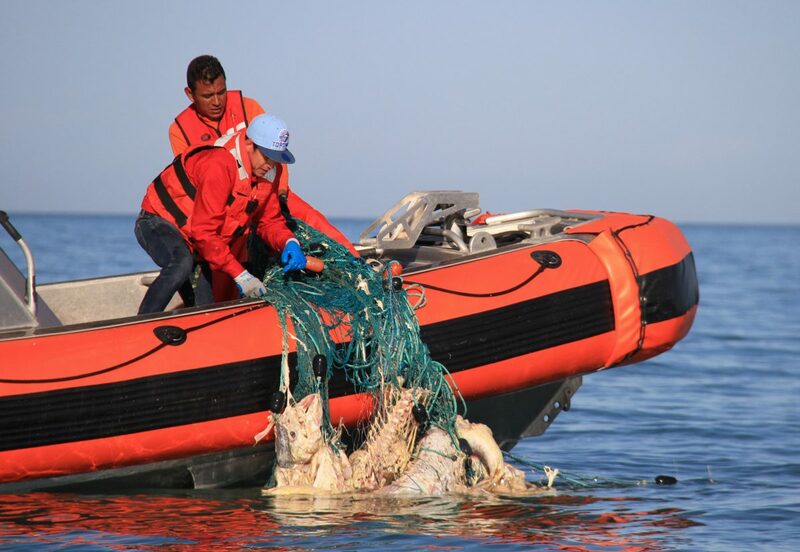 As the men discard rotten parts and slowly haul in the net, three fresher, silver bodies surface, revealing the carcasses’ identity: totoaba, a species of endangered fish that can grow to be the size of a large man. In the early 1900s, totoabas were so plentiful here that they helped spawn the primary fishing communities of the Upper Gulf, including San Felipe, a sprawl of buildings and potholed roads that lines the nearshore. By 1975, though, damming on the Colorado River had irrevocably altered totoaba spawning habitat, and fishermen had nearly obliterated the species for its meat and its swim bladder, which fetched a premium for its use in Chinese medicinal soup. That year, Mexico made it illegal to catch the fish, followed soon after by international and US law. But today’s net is a hint that the trade has surged back to ravenous life. It’s not yet clear what that means for totoabas: the first survey of recovering stocks is only now underway.